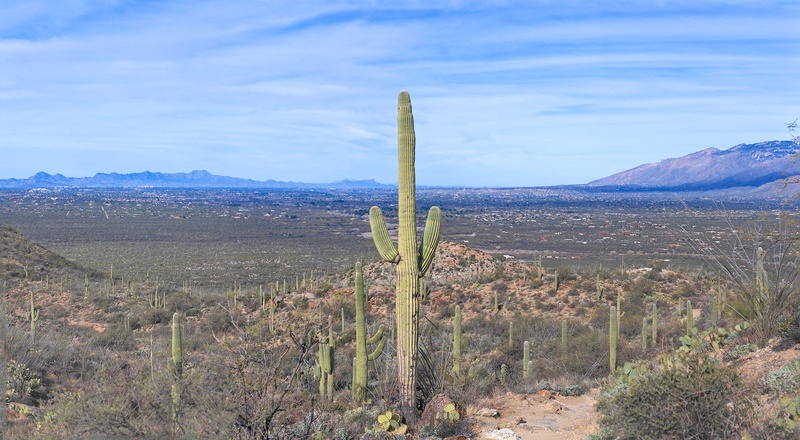 The top of the ridge (at 2070 feet above the trail head parking lot) offers truly sweeping views of the Catalina mountains, Finger Rock and all of Tucson. Amazing! Counting how many feet you have to climb with all the ups and downs, the hike comes in at 2420 feet. Note that I first went to the end of the official trail, and then backed up to the unofficial trail that leads up the ridge. And this is Google Earth’s elevation profile. Note the drastic dip at the very summit. 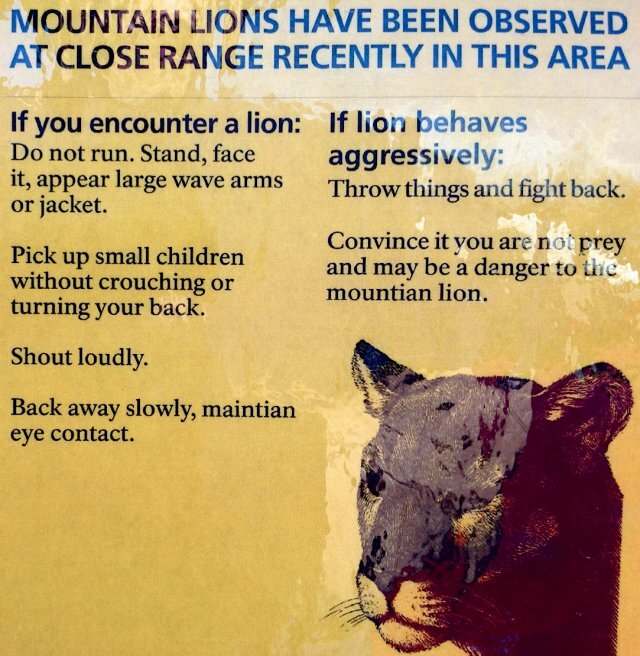 This is not real and is caused because Google Earth clamps the GPS data to its terrain map, as it thought I had walked off the edge of the ridge! These are the panoramas I took. The first one shows how nice the view is early on in the hike, so if you’re not up to climbing all the way up the ridge, you’ll still get some fantastic views. I was particularly struck by the rocks along this part of the trail, as they were unique from what I’ve seen on other trails in Tucson. Some looked more like fossilized wood than regular rocks, and they were strikingly fragmented with cracks. This panorama was taken at the end of the official trail. You can see Finger Rock on the right there. And these three show the 360 degrees of view you get from the top of the ridge. Amazing! This one was taken as I was going back down the ridge. The rocks here were quite precarious sitting on each other. 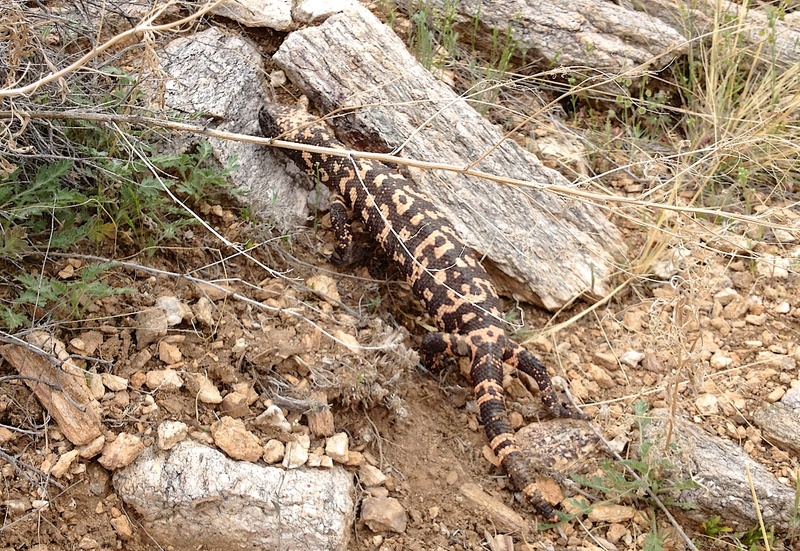 And just before I joined back with the main trail, I happened upon this Gila Monster, nearly stepping on it as it was right on the trail. The canyon is rather long, and it takes some time to make it up to the ridge. 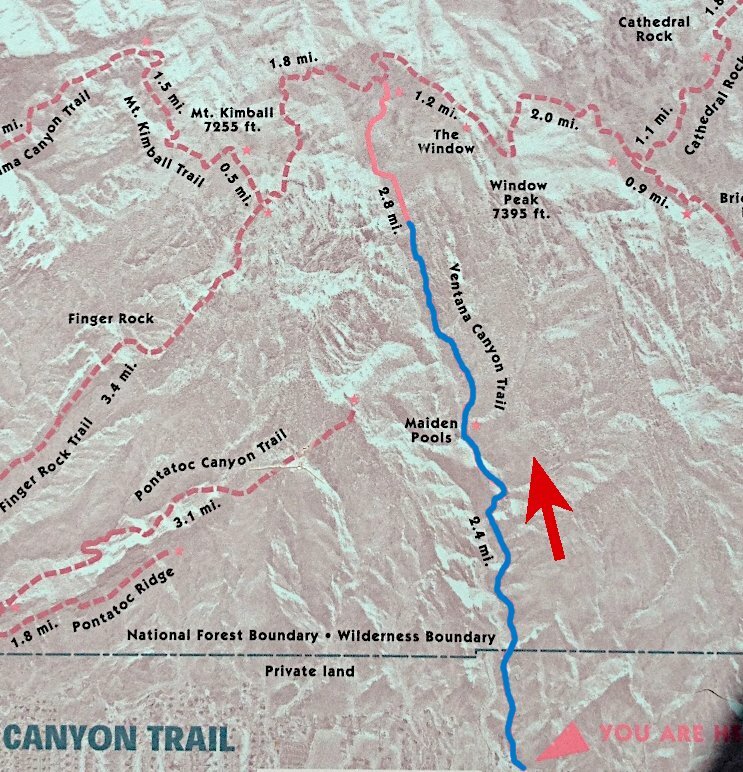 I walked for 2.75 hours up the canyon and still had about a mile to go. I didn’t have the time (nor energy) so I turned around. Even still that was just short of going four miles into the canyon, and a climb of 2200 feet above the parking lot. When you add in the up’s and down’s that’s about 2700 feet in total climbing. 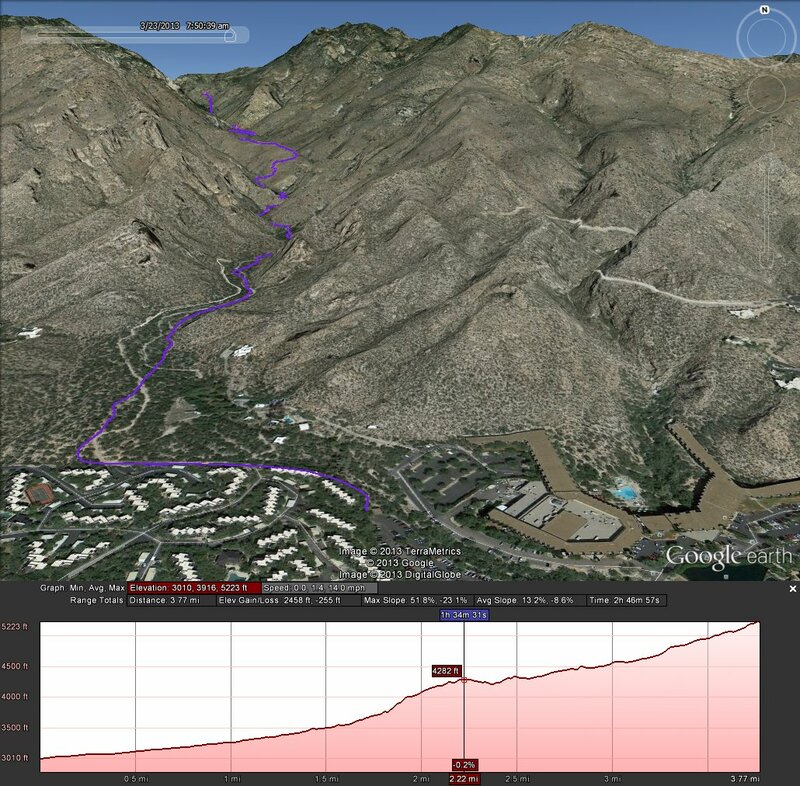 Since I didn’t make it up to the ridge on this hike, I started the Google Earth video of my hike with what the view looks like from the top (GPX file available here). 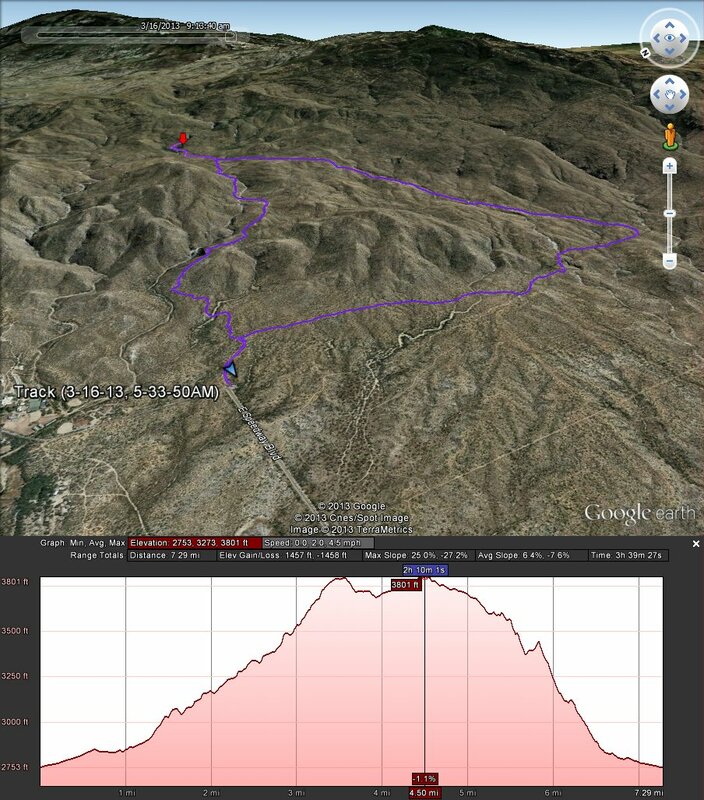 And here’s the Google Earth elevation profile: Here are the panoramas I took on the hike. 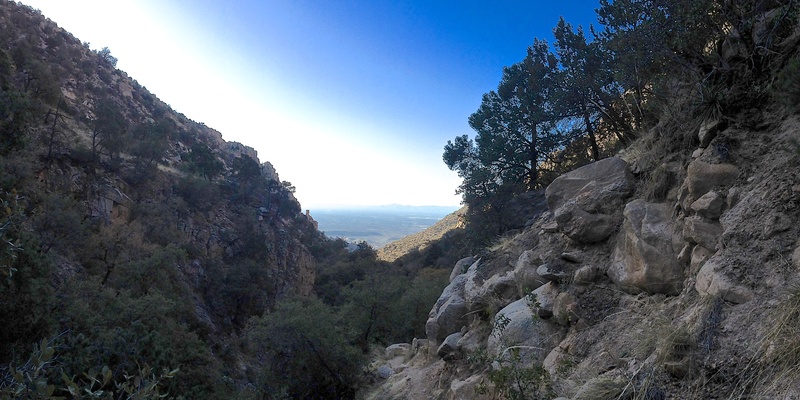 These are looking south towards Tucson, as the trail goes up the canyon: This is a view of the Maiden pools. 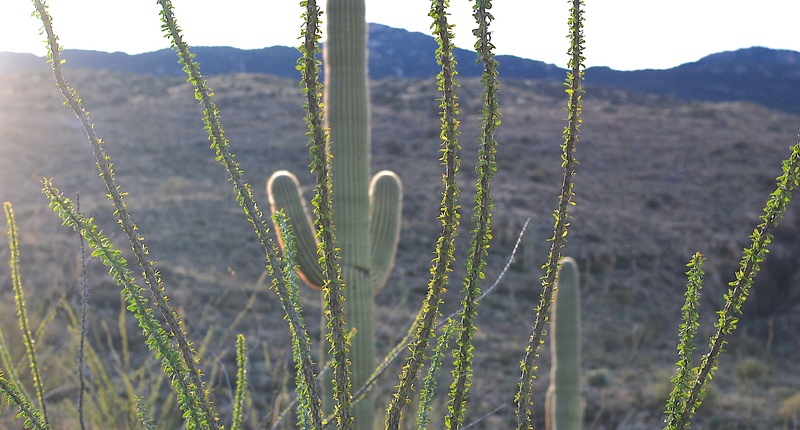 A lot of people hike just up to this point on the trail: And notice the change in vegetation as you get up higher. The canyon narrows and the tweeting of birds was pretty amazing. I’m not a bird watcher, but this seemed like a great place to go if you were one. 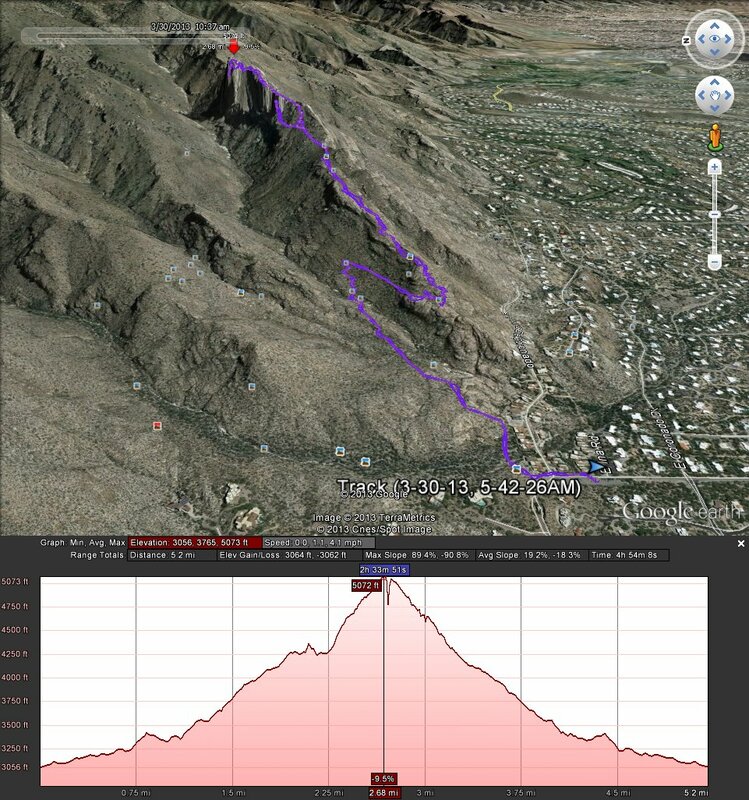 The Three Tank trail is at the east end of Speedway Blvd, and is the easier route up to Bridal Wreath Falls, mainly because it is a more gradual climb than the Douglas Springs trail (which I have previously posted on). And here are some of the panoramas that I took. These are all on the Douglas Springs trail as I headed back down to the trail head. 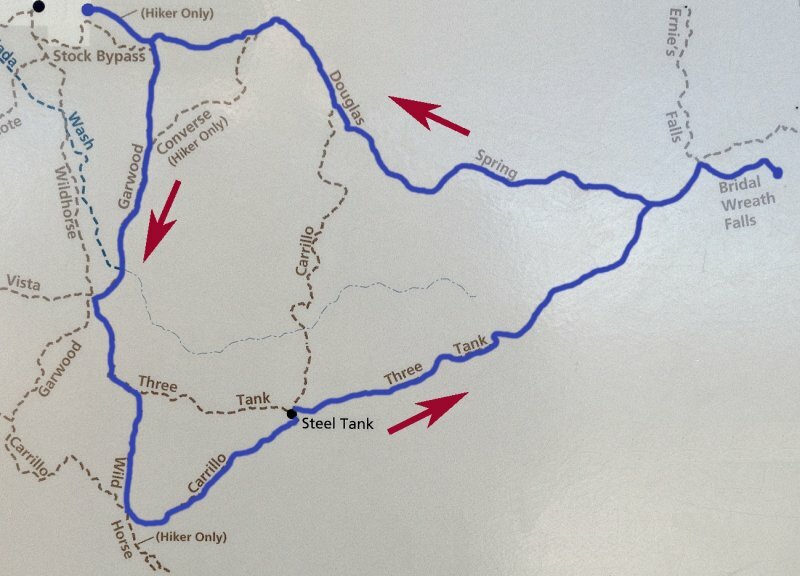 UPDATE 2014-02-08: I went on the Three Tank trail hike again this weekend and took some more pictures. The above photos were taken as I descended down the trail, while the following photos are from early morning as I started out on the trail and then ascended past the large tank (second photo).